Good God, what have they done? What have Nancy Pelosi and House Democrats just done to America and the Constitution? House Democrats have just passed their nationalized health care bill. 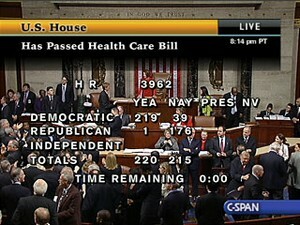 The bill passed 220 – 215. So much for that bipartisanship that President Obama promised. 176 Republicans voted against the bill, a long with 39 Democrats voted in opposition to nationalized healthcare. In the end it was the opposition to the Democrats nationalized take over of health care by Republicans and 39 Democrats that was the bi-partisan vote, not it’s passage. America, ask yourself this … how does a healthcare bill that claims to reform and cover individuals cost $1.2 trillion and only provide coverage to 96% of Americans? One would say that only 4% of Americans really don’t have health care in the United States when you factor out illigals and those that did not want health care coverage as a choice. The Imperial (Democrat) Congress (see vote result here) has just taken the first step to push down the throats of Americans nationalized healthcare care. A victory for the Democrat party and a loss for America and Americans. Michelle Malkin’s Live Blogging the event, or should we say circus. Our Founding Fathers are rolling over in their collective graves tonight. Don’t ever forget what just happened and who was responsible for this partisan government take over of 1/6th of the US economy. Hear Nancy Pelosi’s words loud and clear. The extremist bill coming out of the Imperial Congress was completely endorsed by the so-called moderate President Barack Obama. Obama has made health care reform his signature legislative priority — and he put his personal prestige on the line Saturday by traveling to the Capitol to rally Democrats, telling them to “answer the call of history” by passing the bill. Election have consequences and this is what happens when you do not pay attention and vote for a social science project rather than understanding the policies of a candidate. How many people would have voted for Democrats and Obama last November if they knew this bill would be crammed down their throats? How irresponsible could a Congress be? With 10.2% unemployment, people loses their jobs, their homes and struggling mightily … Imperial Congress passes a bill that would cost $1.2 trillion to an already out of control deficit. And it still would not cover every American. WAKE UP AMERICA!!! Wasn’t that the supposed purpose of the bill in the first place? To cover all Americans! Wake up, the point of the bill was to control you. As pointed out by Powerline, it was the charade of the Stupak Amendment that allowed any of this to occur. Do you honestly think Democrats are not going to add paid abortion back to this bill? Obamacare: Pelosicare EDITION … Nashville, TN Tea Party “Pink Slip Rally” … Vote for Socialized Healthcare & You are Gone! You have just joined the ranks of highly developed countries. The first step to defeat disease as one of mankinds greatest challenges! Unemployment is what the economic cycle dictates after a crisis + recession. All over the world. It will come back up. The dems cannot fire people. It will come back up and if you stop bombing other people you will have money to pay for the health of your nation. 39 dem. noes are nearly 20% ‘bipartisan’ vote. The reps don’t even manage one measly percent. This Cao guy ought to be given a medal for backbone. Something that all other developed democracies have passed and tested can hardly be called a science project. You can call it long overdue. You don’t like it? Argue! The democrats are pretty bipartisan and weaken themselves. But don’t just throw insults out there. Whoopsy. 15% bipartisans. Sorry, my mental arithmetics failed me there..
actually believe that people are going to pay $15,000 a year for death care.most of the supporters of obama are the first ones that will be jailed. this nothing more than liberal BS that will be used as population control. #2, the word is math, arithmetic for young children and rednecks. remember how many obama has murdered with his war. all you chickendicks can do is blame someone else for your ignorance. bipartison ? hardly. communist ? totally.